Calling all warm weather essentials and sunny standouts: this month we’re taking on the long days and haute nights with a sultry selection that will keep you chic all summer long. What a treat! I'm very pleased to receive 5 deluxe size products and a fragrance bonus I've never tried at home in the past. 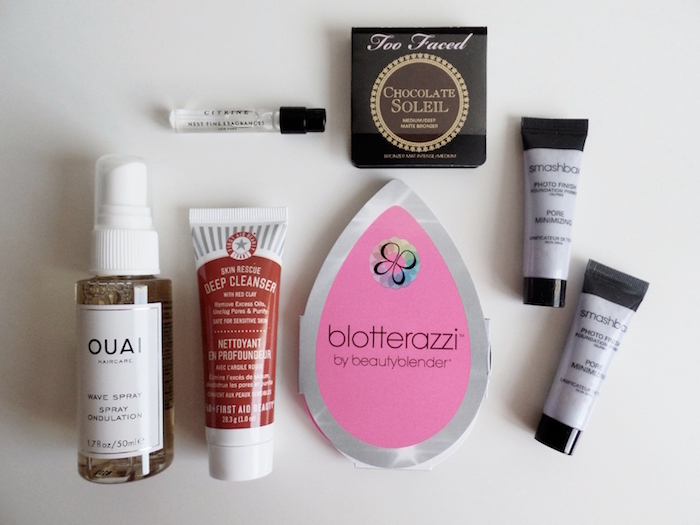 Popping the paper fold-ups open, I'm greeted by the NEST Citrine EDP fragrance sample (1.7oz, $68), Blotterazzi (sold with a case and 2 sponges, $20), a single use Liquid Blendercleanser, and Too Faced Soleil Matte Bronzer in Chocolate (10g, $30). 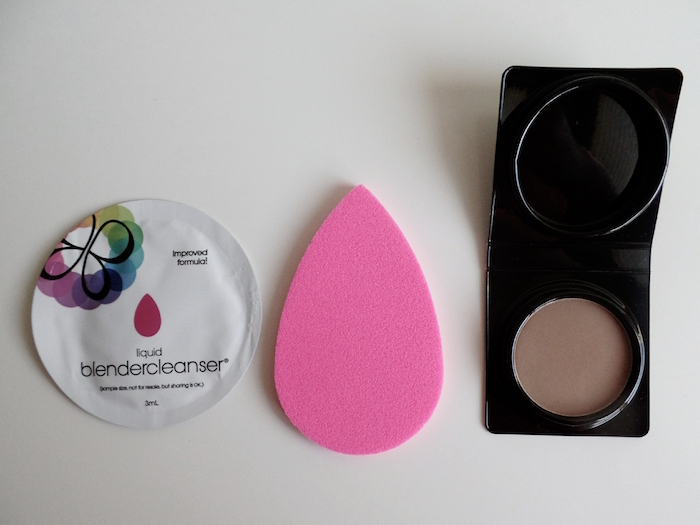 The Blotterazzi is full sized and is of huge interest to me as it promises to work exactly like oil blotting sheets but is in the form of a sponge (of the same material as Beautyblender). The Too Faced Soleil Matte Bronzer more than anything else, smells sooo good! It's like dessert for the face without the added chocolicious calories. :) The 2.5g sample (rather generous as it's 1/4 of the full size) is perfect for travel and those trying out the product for the first time. My MAC 168 brush fits the pan perfectly making the product ideal for bronzing. I have medium skin tone right now and it's not too dark but definitely visible after 2 brush strokes. It's definitely matte and darkened a little after hours of wear so those with lighter skin tones might want to use this with a light hand. In a pinch, it will also work perfectly as an outer V contour powder. The NEST Citrine EDP? It smells so divine! It's rather opulent making it perfect for fall and winter. I'm all about hair and skin care right now and my (finally) medium bob loves the OUAI Wave Spray (50ml, $26)! It's 1/3 of the full size and it's perfect for more than a month of trying out and traveling. This weightless texture mist promises effortlessly chic, undone hair which is a big yay for me since I'm all about having disheveled and bombshell tresses year round. Instructions aside, I've used it on wet and dry hair and it's fine on both. It smells very fresh and citrusy, just perfect for the hot and sticky days ahead of us! We're down to the last two products and they're both for the face. The First Aid Beauty Skin Rescue Deep Cleanser with Red Clay (4.7oz, $24) was a joy to use since it really cleansed my combination skin without over drying. It's in gel form that deep cleanses, detoxes, and unclogs pores with every use. I've used this twice a day for 4 days and I can see myself using this more and more. It was nice to receive two 0.25 oz samples of the Smashbox Photo Finish Oil Free Foundation Primer Pore Minimizing variant (1oz, $39) since I'm currently on a primer craze. The product is on the light beige side and not purple so don't expect brightening here. What you can expect though is having super smooth, poreless complexion in a few pats meriting the legit use of the hashtag #nofilter. To sign up for Play! 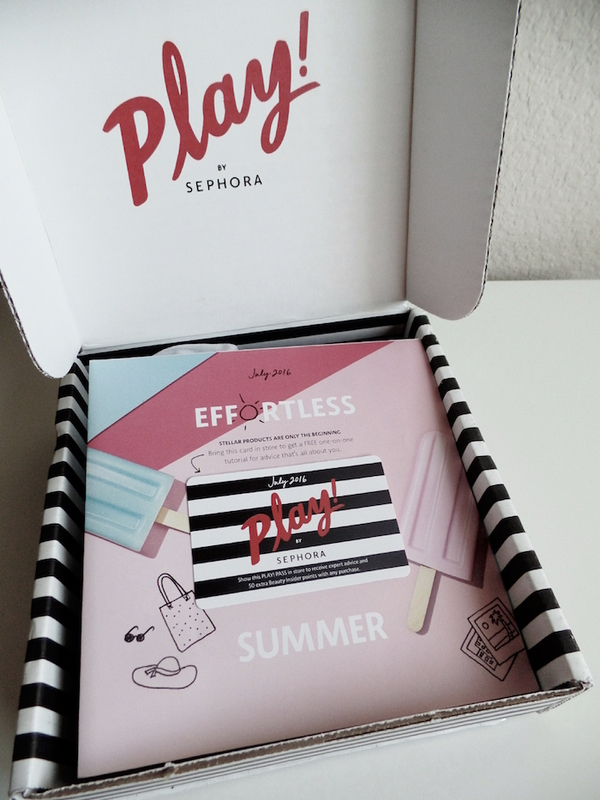 by Sephora waitlist, head on to Sephora.com/play.